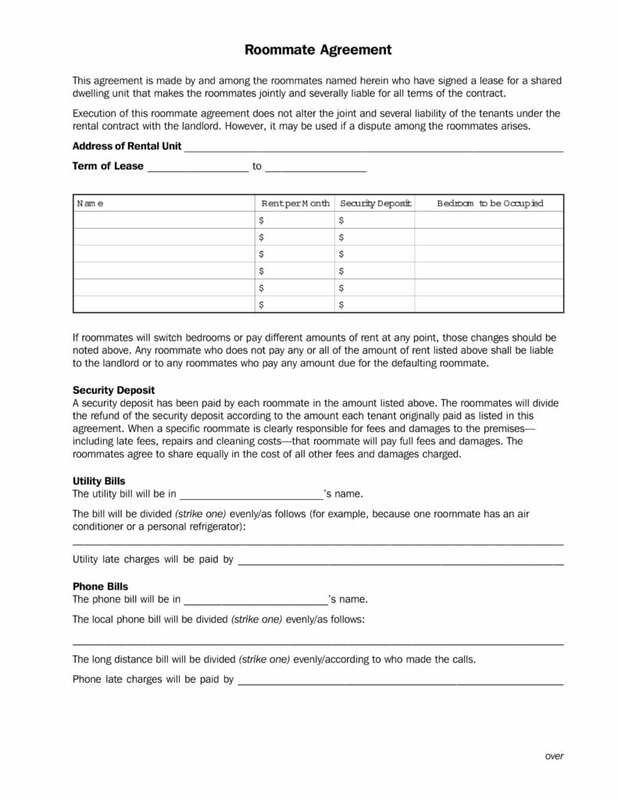 This Roommate Agreement Template is a Generic form which you can download by clicking on the download link below. This agreement is between two tenants who have jointly signed a lease for a shared Dwelling unit, and both are liable to the terms and condition of the lease. Any of the conditions or liabilities in this Agreement do not Alter or Change anything mentioned in the Original Lease Agreement with the Landlord. The complete address of the rental unit i.e. the premises that is being shared between both the roommates and the term of the original lease. The names of the roommates will be occupying the said premises along with the rent each one will pay per month, the security deposit they have to pay and the bedrooms that will be assigned to them individually. Each roommate has to pay the security deposit listed in this agreement and that they will divide the refund of the security deposit according to the amount of the each paid originally. The next point is about the utility bills, the bill originally will be in one single occupant’s name but will be divided it evenly among the roommates. The phone bills will likewise be divided equally among each of the roommates and the long-distance calls made will be billed accordingly to who made the calls. Cable bills and Internet bills will also be divided evenly among the roommates so as not to take undue advantage of each other. Neither of the roommates is allowed to sublet their bedrooms without permission of all the other roommates. Each roommate is responsible for the behavior of their guests and they will take care that the guests were do not disturb the other roommates and may only stay in a shared area if it is okay with the other roommates. All the roommates must agree on the setting of quite as during the day, owning pets and being responsible for them, smoking in the apartment or shady areas. Household duties like taking out the trash and cleaning the bathroom etc. will be divided equally among all the roommates and each roommate must follow it. All the roommates together can add any other terms they think are important to this agreement. Each and every roommate must sign at the bottom of this roommate agreement for it to be viable.